Came to UV lights set on greasewood/mesquite/cactus incline below jagged spires of Organ Mountain Range. 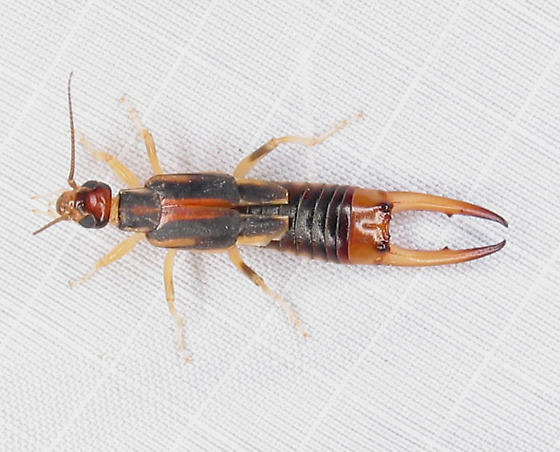 I failed to see an earwig in bugguide with this combination of features: white feet; large pale cerci; cerci toothed posterior of midpoint, head red shaded to black; sutural red stripe extending less boldly onto pronotum; pale humeral stipes end halfway back; abdomen fairly short; terminal segment testaceous; posterior humeri dark on distal half, at least on dorsal surface. Do you have any images showing the 2nd tarsal segment? That would probably be enough to take it to family. Even without that, the cerci and the color patterns on the back definitely match those of Labidura riparia images I've seen. couplet #1 of the key on page 3 of this pdf file has 12-16 antennomeres vs. 10-30. It's hard to count them in this image, but I can tell there are way more than 16. That eliminates Forficulidae and Chelisocidae. The forceps on Pygidicranidae bend inward more than with this specimen, while Carcinophoridae are bent asymmetrically. Which brings us right back to Labiduridae. I would say it's safe to ID this as Labiduridae, which Nomina Nearctica shows with only the one species. Of course, the collection location is close enough to the border that one couldn't rule out a Mexican species. Here are the tarsomeres, Chuck. The key feature here is whether the 2nd tarsomere extends underneath the last one, whether it's dilated or elongated. I don't see how that could be true here. It looks like the 2nd tarsomere is normal in shape. In all three of the keys I have access to, that leads straight to Labiduridae or Labidura. Unless there's some newly immigrant species whose presence in the US is unknown to the writers of those keys and of Nomina Nearctica, this should be Labidura riparia. Thanks for working on this one, Chuck. I zoomed in on the antenna in my only original photo of this specimen and was easily able to count antennomeres. Later, when time permits, I'll darken the image in PhotoShop to see if I can get a reasonable view of tarsomeres. Thanks for the help. Possibly Labidura riparia. Predaceous on chinch bugs, mole crickets and other ground-dwelling species. you've caused me to go googling. I found quite a few images labeled L. riparia, and although some had strong similarities, none were close enough to convince me. However, I think I have learned enough from my search to call this one a male.